Consistent and correct amplitude is one of the most important factors in achieving a high-quality ultrasonic weld. 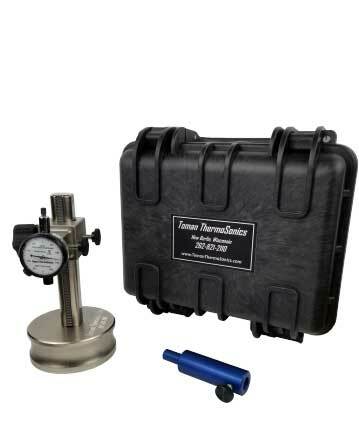 The Amplitude Gauge makes measuring and setting that amplitude easy. Simply bring the gauge into contact with the ultrasonic horn, press the welder test button and read the total amplitude in microns on the dial. Determine variances in amplitude from welder to welder, use the gauge on several areas of the horn face to indicate a bad or unbalanced horn, or check for horn overstressing which, found early, will save many horns from cracking. When measuring the amplitude of an ultrasonic horn, place the gauge in several different locations on the horn. This will help determine if you have consistent amplitude across the face of the horn.